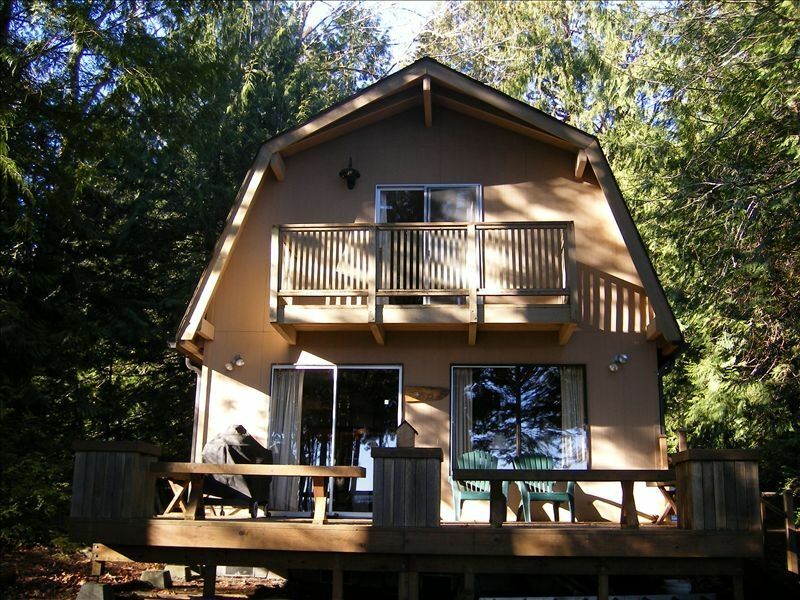 Located on Harstine Island, approximately two hours from Seattle or 45 miles north of Olympia, this high bank waterfront cabin has breathtaking views of the Sound and Mt. Rainier. This is a gated community with beach homes known as Hartstene Pointe. The community has 3 1/2 miles of community beach, nature trails, picnic areas, a heated outdoor swimming pool and hot tub (seasonal, ask owner for dates the pool is open), playground, tennis & basketball courts and a clubhouse with library, ping pong tables and free wireless Internet access, although we now have wi-fi at the cabin. The Pointe is home to many animals such as: red fox, deer & eagles frequently seen in their natural setting. This two story cabin has an open floor plan, spacious living and dining rooms with sliders off the dining room to the outside deck with a gorgeous view of the Sound and Mt. Rainier. There is one bedroom on the main floor with twin beds, the master bedroom upstairs has a queen size bed and a balcony with a view of the Sound and a 3rd bedroom upstairs has 2 queen beds and a single, fold-out child's bed. The cabin is fully equipped for your convenience. Amenities include a newer wood burning stove, stereo/CD player, TV, DVD player, wireless internet access, microwave and washer & dryer. There are many things to do such as: hiking, swimming, beach combing, exploring the trails and the Olympic Peninsula, or just relaxing by the fire reading a book, or barbequeing and enjoying the view. With the serene natural setting it is a great place for a long vacation or a weekend getaway during any season. ***Note from owner; We currently have the cabin listed for sale in the MLS and we cannot take reservations unless it is within the current month. Please contact me first before booking or paying. Community fitness room and equipment. There is a library at the community center. Ping pong and pool table located in the community center. A few DVD's to choose from. Small balcony off of master bedroom. There are a few tennis courts. A few at the community center and one down at the pointe along the beach. This is such a cozy cabin in a beautiful location! I had a perfect birthday weekend here and would definitely come again. I appreciate Nancy's responsiveness and flexibility as the property owner. Thank you! Absolutely loved the house, perfect for our christmas, very warm and cozy. Also the house is in a great central location for exploring the state of washington. The only caveat is the stairs with a railing on the wall side, but no railing on the open side above the living room. If you can deal with that, this is a comfortable, homey, and well equipped cabin. Nice view of Rainier across the water (on a clear day), and nice deck for breakfast on a sunny morning. Will definitely look up this place when we return to the Pointe. You can not go wrong with Harstene. Beach is lovely - Cabin is cute and simple. Deer came right up to the back deck... where we were sitting enjoying the woods and view of the water. The cabin is simple and laid back. A bit rustic but effective. Clean, close beach access, nice water view. Relaxing and beautiful! Awesome view from the peaceful deck. Peaceful, quaint, clean and well organized cabin. Loved it! Excellent hostess and wonderful accommodation. Beautiful view from the deck! Relaxing, clean, well organized, quaint and peaceful cabin at Hartstene Pointe. We enjoyed our stay and appreciated the serenity while walking on the bluff trail, playing tennis at the beachside court, and relaxing at the clubhouse pool and hot tub each day. Fantastic refreshing retreat for our family. Thank you Nancy for being a wonderful hostess! Golf course about 30 minutes away in Allyn. Movie theater and Safeway about 30 minutes away in Shelton.